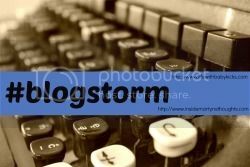 #blogstorm is back; a monthly linky for all things bloggy, opening on the 29th of each month and staying open for 2 weeks, for any and all blogging related posts hosted by myself and my #blogstorm partner in crime Martyn from Inside Martyn’s Thoughts. We love reading your blog tip posts, and you guys haven’t let us down. My favourite post was from the lovely Mrs Tubbs over at Someplace Strange and her post “So, You Want to be a Blogger” I love the advice of just do it, but then the deeper in-depth look. I know I just dived in headfirst, type now think later. It’s done me well so far learning on the go! Martyn’s featured post is from Vicky, of Single Mother Ahoy, and her podcast from vickycharles.com on how to make the most out of Facebook as (in his words!) he is rubbish at it! This month I am linking up a post on my new found love of Instagram, a social media tool I hadn’t really considered before but I am completely loving at the moment. Martyn is linking up a post on how to find your unique voice; something which helps you stand out from the crowd. We are open from 6am GMT 29th October closing at 23:55pm on November 12th – happy linking. 3. Comment on this post and at least 2 other linked up posts that tickle your fancy. Its commenting and sharing the love that makes this community great. Remember hosts love comments too! Oh no way! I love that everyone has different ways and thoughts on the whole blogging escapade, bringing new ideas on how to look at it!